Boomer! We’re less than three weeks away from kickoff in Pasadena. I couldn’t be more excited to play a storied program like Georgia. It’s crazy to think that two programs like Oklahoma and Georgia, who have been name brands for so long, have never met on the field. Over the next three weeks, I’ll be posting hopefully a little mini-trench each day leading up to it. Don’t crucify me if I miss a day or two, but these will be smaller versions of the full blown trench warfare posts I do each week. 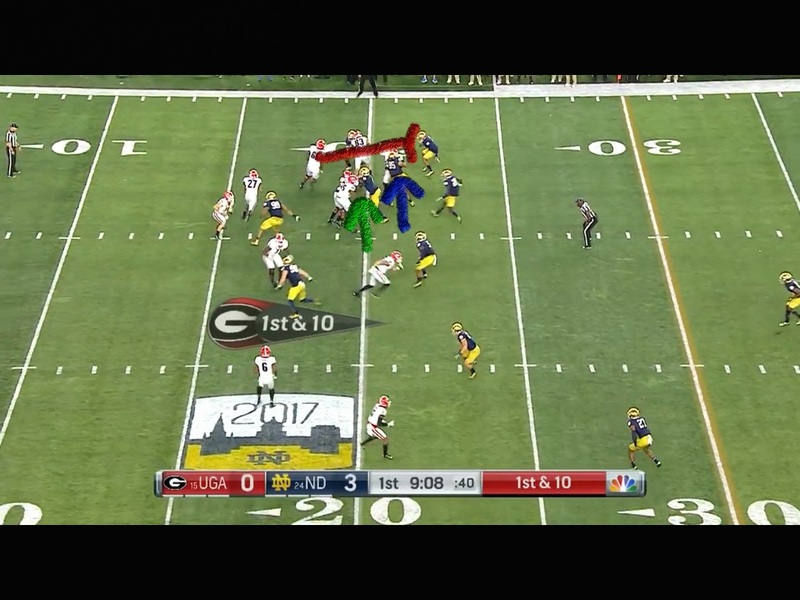 Simply put we have more ground to cover to get a good cross section of what Georgia does offensively and defensively. So, you guys and gals may have to put up with about 15-20 posts over the next few days. Defensively, the Bulldogs are good, very good. They’re not invincible, but they’re good. 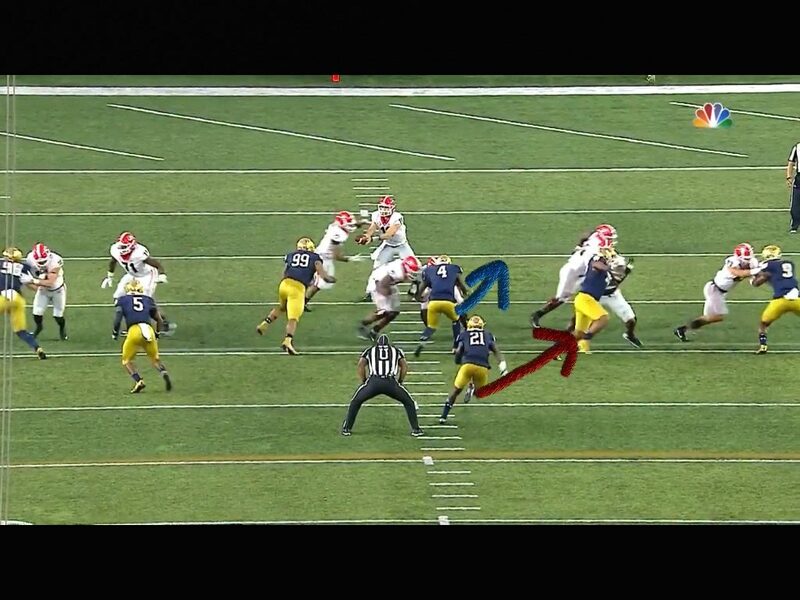 You’ve all heard about Roquan Smith, the Butkus Award winner, but along the interior, the guys I notice first are #5 Julian Rochester who goes 6’5″ 300. First off, for the big uglies if you’re going to wear a small number you have to be legit. Kind of an unwritten rule. Also #78 is 6’4″ 295 Trenton Thompson. He’s the one who concerns me the most. He’s very active, quick and mean. All three things you look for. Starting with Notre Dame, the Bulldogs went into South Bend and came away with a win, which is not an easy thing to do. If there’s a part of the game that will determine the outcome, it will be the Sooners’ offensive line being able to protect Baker Mayfield. Baker is very accurate and goes through his progressions very well. If the Sooners can give the Heisman Trophy Winner time like the Irish gave to QB Brandon Wimbush below, then there are plays to be had. Pre-snap, the Irish came out in what appeared to be a run heavy formation. As I’ve said many times you create more space in the secondary by forcing the opposition to go with bigs defensively. Instead of 5, 6 or even 7 db’s, giving your receivers room to roam in the secondary simplifies reads and gives the receivers potential for run after the catch. 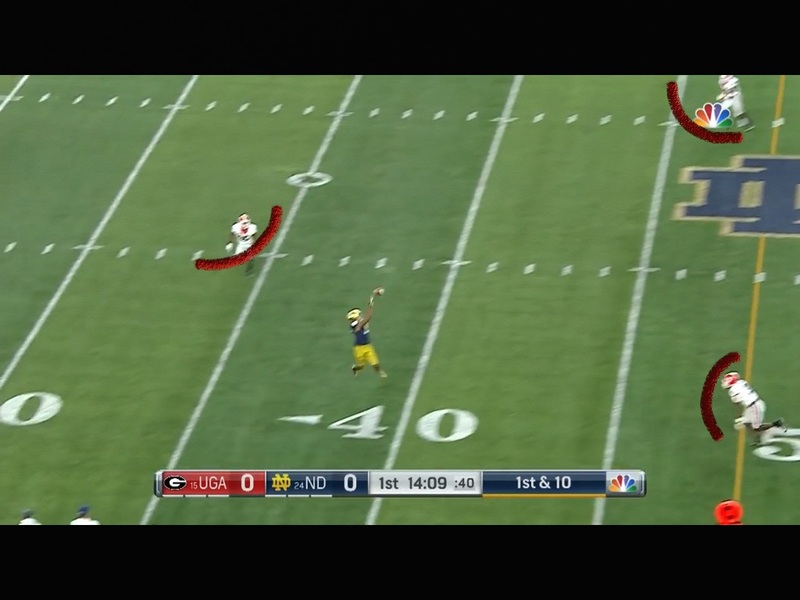 Wimbush had plenty of time here, but was off target. 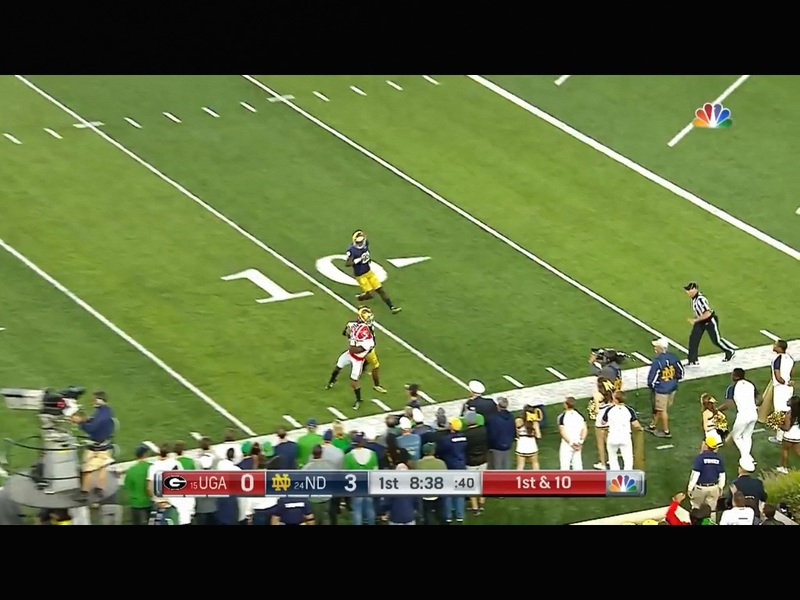 It was a completion but likely could have been much more if he hits the receiver in stride. If the Sooners can protect, Baker can deliver the ball on time, and put it where the guys can run unlike Wimbush did here, then this was likely a TD. 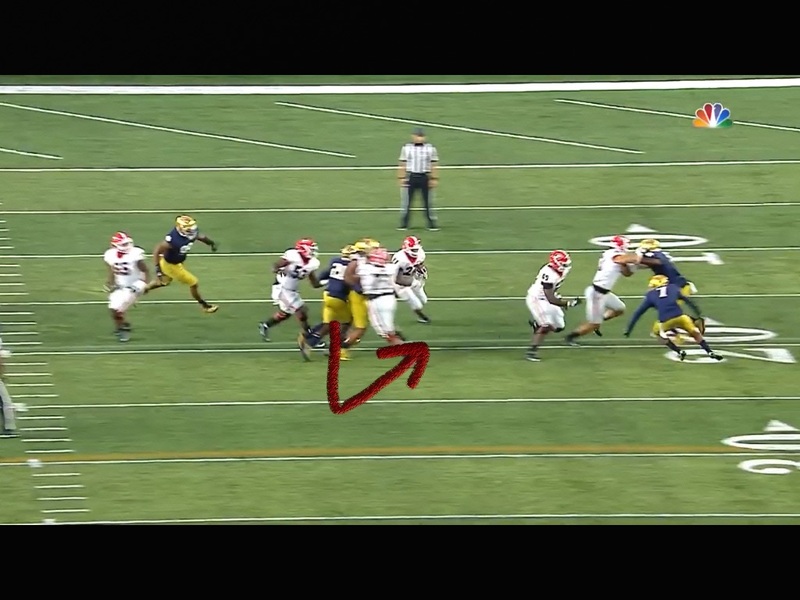 After the long completion, the Irish did a good job keeping the Bulldog rush out of Wimbush’s face. 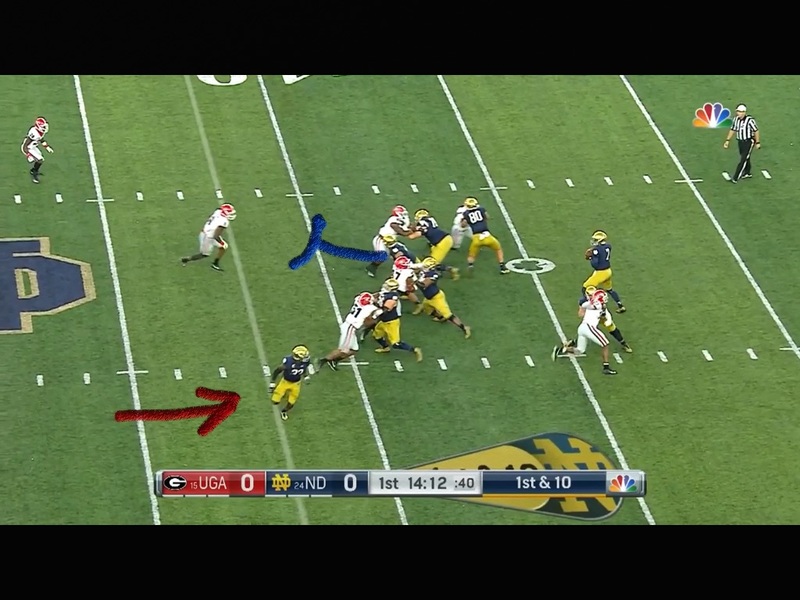 This is solid protection with a nice pocket for Wimbush to step into. The defensive ends for Georgia are maintaining nice leverage outside to keep him in the pocket. Wimbush got a bit of happy feet here. He had time and space to step into, but he rushed the throw. If Adams, the Irish RB, breaks off his route and heads down the numbers, then this is likely a TD as well. The crossing route on the 10 yard line is pulling the safety out of that space, so if this pass is on time, then Adams likely doesn’t get caught. The pass falls incomplete and the Irish have to kick the field goal. When Georgia has the ball, Nick Chubb is 5’10” 225. Think a little bit smaller, little bit faster Samaje Perine and that’s who Chubb is. He’s tough, powerful and going to be a really good NFL back. When he got the ball here, Left Tackle, #77 Isaiah Wynn did a great job turning the D Tackle down inside. #65 Kendall Baker is pulling around to swab the hole. Three mistakes made by the Irish here. 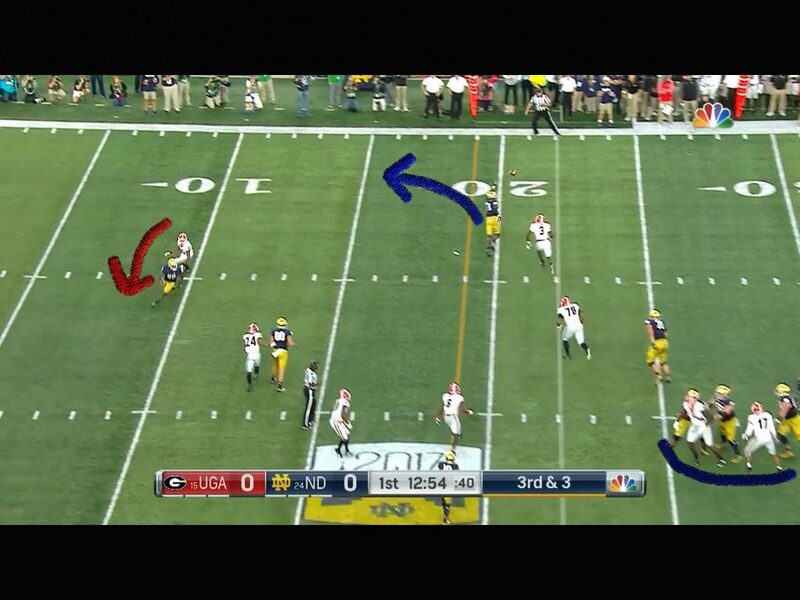 #4 Te’Von Coney has to fight harder outside to the blue arrow. #21 has to follow Baker outside to squeeze the hole down, and the D-Tackle is turned sideways and has no leverage against Wynn. You hear the term “run-fits” all the time. #21 should be back out and meeting Nick Chubb in the hole. 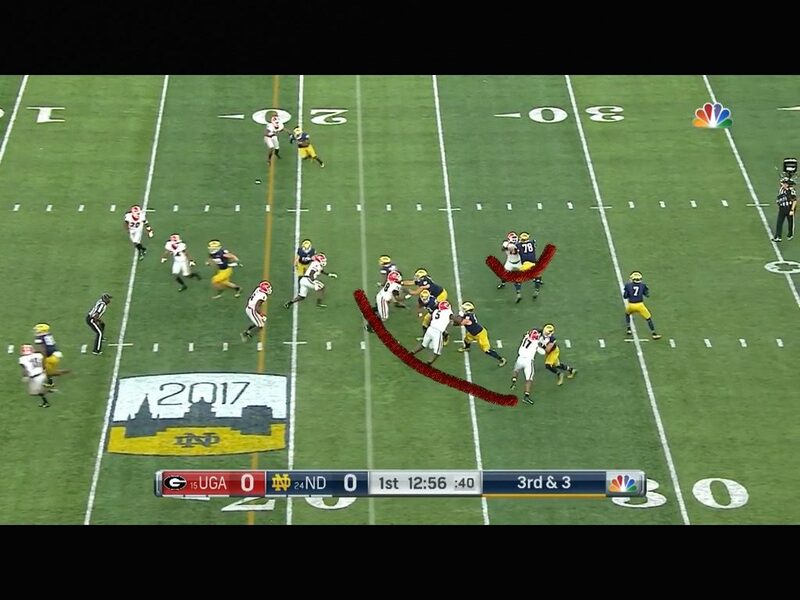 He tried to undercut the gap, and it cost the Irish 30 yards. But that’s what the Bulldogs do. They’re big, physical and talented. They’ll beat on you until these runs pop. If the Sooners can’t play physical, gap-exchange, fit the right gaps and tackle, it’ll be a long night. Much has been said about Jake Fromm being a Freshman. Well, sorry Sooner fans, the kid can play. He’s really good at throwing the fade routes and sideline routes. He has nice pocket presence, and doesn’t seem to get rattled. This is really solid protection by the Bulldogs, virtually negating the Irish rush. Up the middle, the Sooners will need Du’Vonta Lampkin to have the game of his life on the inside. 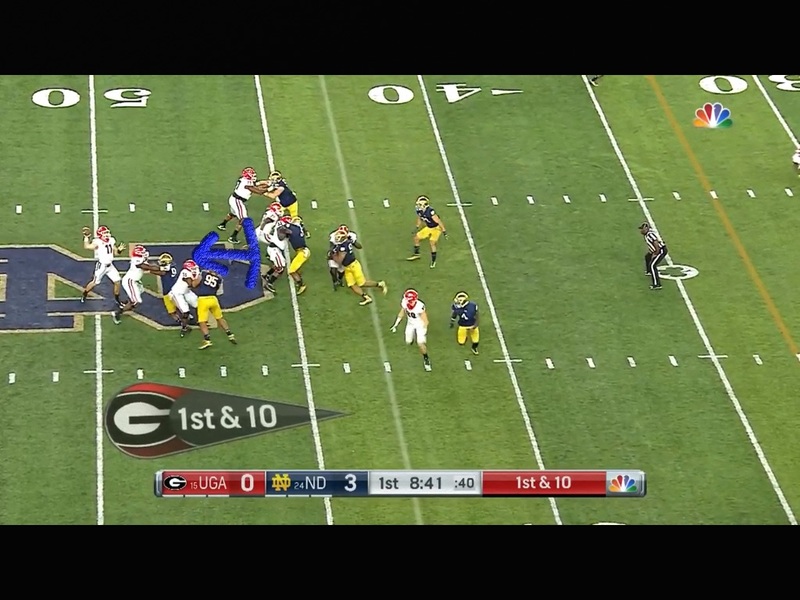 He’ll need to squeeze the pocket back into Fromm’s face giving Obo and Kelly time to get home. Kenneth Mann and D.J. Ward will need to play well as well. Simply put, the receivers for Georgia are playmakers. I don’t know that I’ve seen better playmakers on jump balls than #6 Javon Wims who’s 6’4″ 215 and Terry Godwin who’s a nightmare in the slot at 5’11” 185. I love Godwin’s attitude. No pun intended, the guy is a Dawg. The young secondary for the Sooners will need to make plays on the ball, and the entire defense is going to have to be on point. Georgia doesn’t throw as much as what Oklahoma’s used to seeing, but it’s not because they can’t. They’re big, fast and talented.